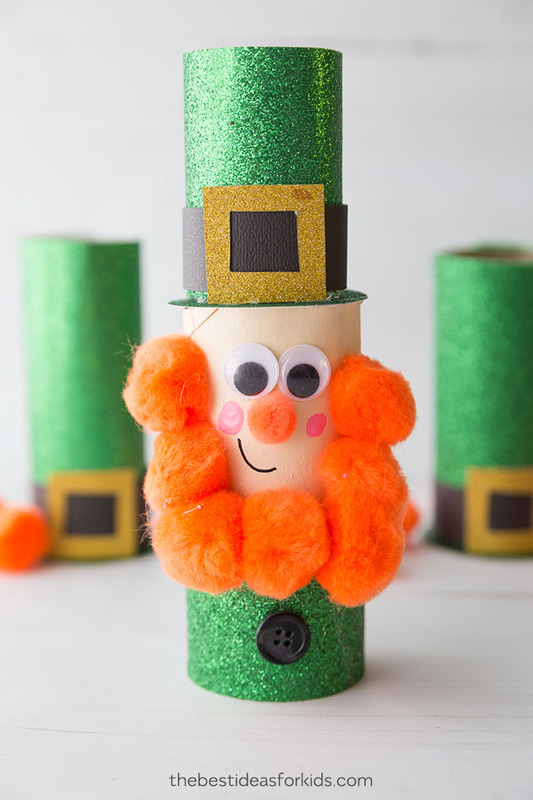 If you’d like a little luck of the Irish on your side, you may want to make this easy toilet paper roll leprechaun craft. 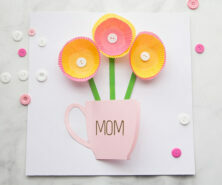 Kids love to make things out of toilet paper rolls, and we love that it’s a great way to recycle them into something new! 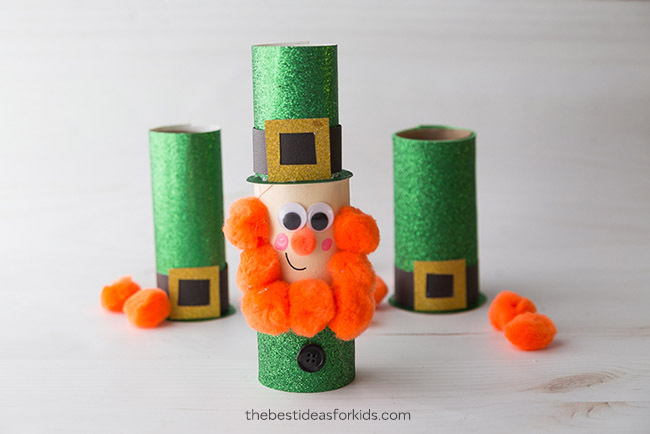 You can make a toilet paper roll leprechaun or even just make a paper roll leprechaun hat. We’ve even seen similar hats turned into leprechaun traps. 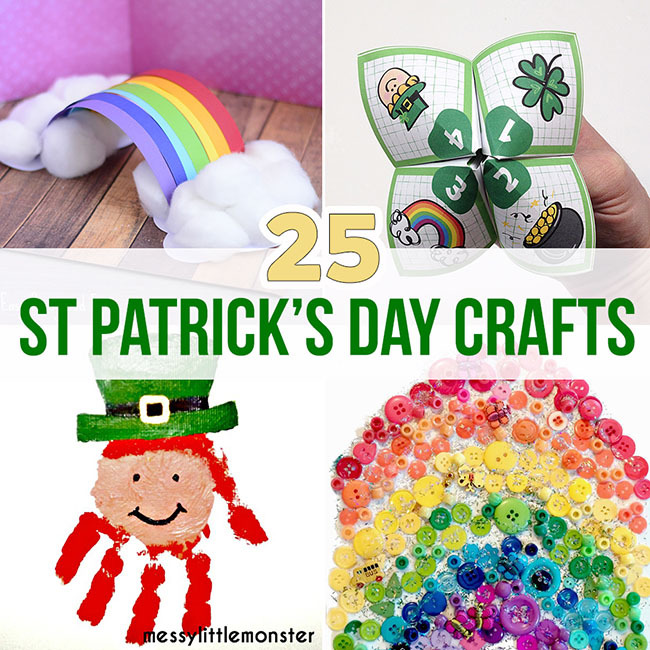 Save those paper rolls since you can create so many different St Patrick’s Day crafts with them! Make a leprechaun or just make a leprechaun’s hat! You can even cut up some paper rolls to make a paper chain rainbow. 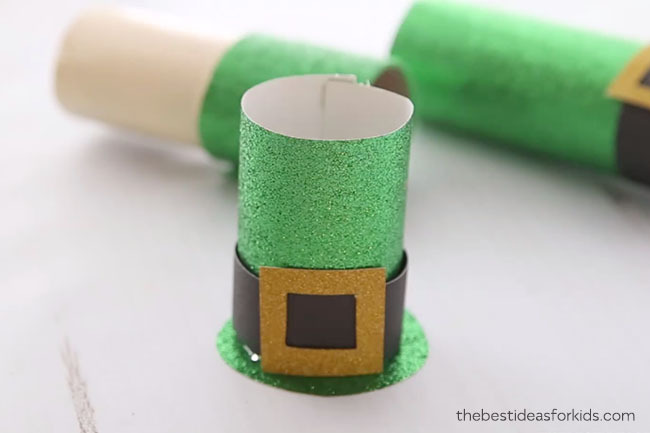 This paper roll St Patrick’s Day craft is easy to make and a lot of fun for kids to put together! We love how the leprechaun has a personality. 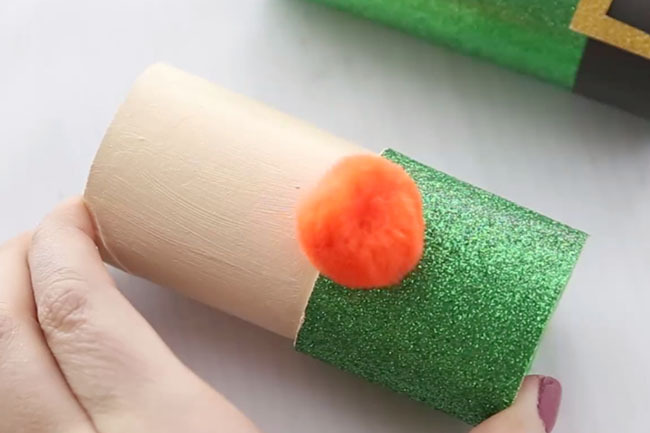 With just a few supplies, you can transform your toilet paper rolls into these adorable St Patrick’s day crafts. Place them around a classroom or your home to get into the festive spirit for St Patrick’s Day! 1. 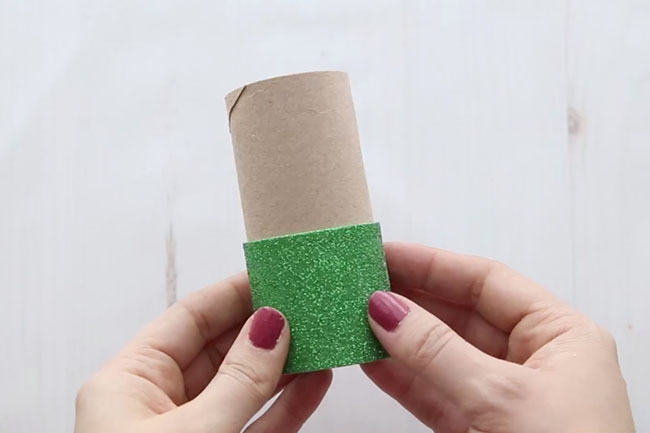 First cut a strip of green glitter paper to wrap around the bottom of your paper roll. Tip: Foam glitter paper works better than cardstock since it will bend easier. 2. 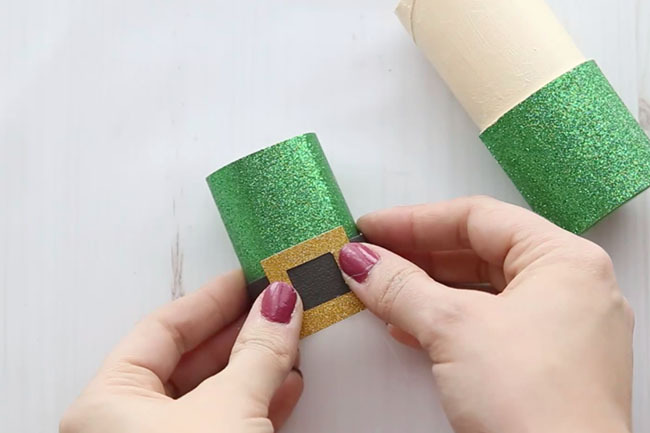 Make the leprechaun’s hat by wrapping green glitter paper around to form a roll. Glue a strip of black on top and then glue a gold glitter paper buckle on top of this. 3. 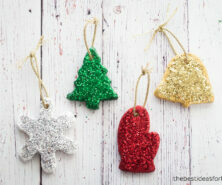 To make the bottom of the hat: cut out a circle from your green glitter paper. You can trace around something that is circle to get the shape or use a circle puncher. Glue the top of the hat to the green glitter paper circle. 4. 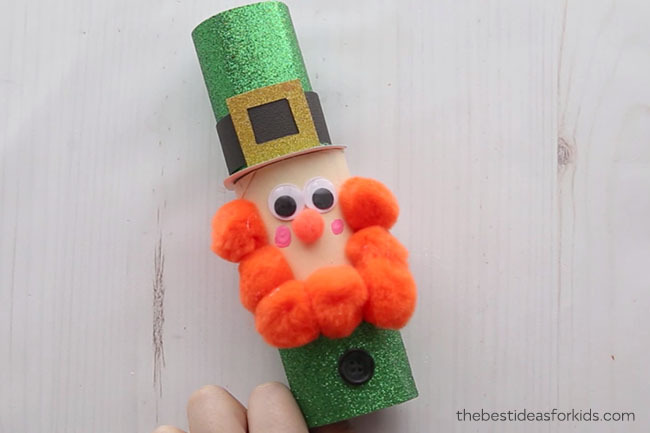 Paint the top of the paper roll for the leprechaun’s face. We used this color for the leprechaun’s face. Now start adding your large orange pom poms to make the beard. 5. Glue on the googly eyes, pom pom nose, black button and add two small pink circles with paint for the cheeks. Then glue the hat to the leprechaun paper roll. 6. Add the smile with a black sharpie. 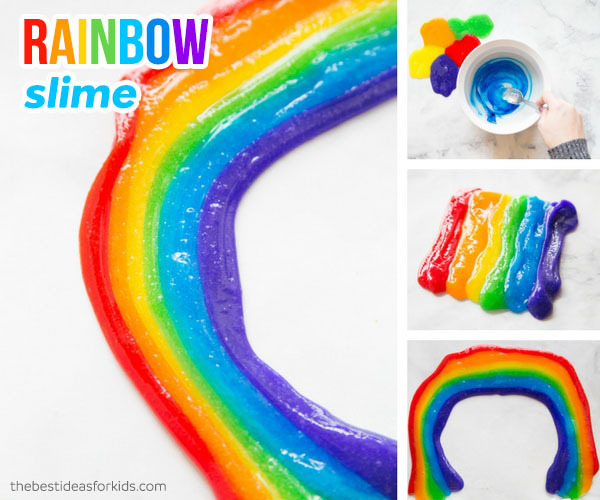 We love how easy this leprechaun craft is to make! 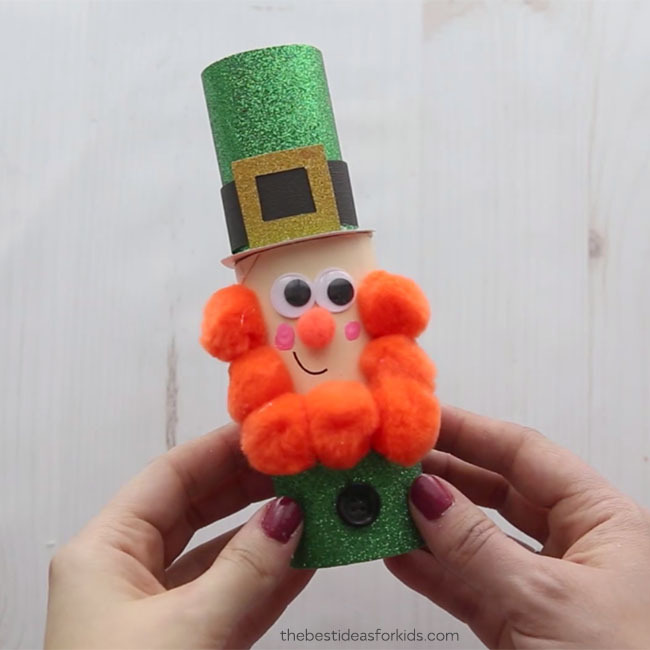 If you had fun making this leprechaun (because he’s pretty cute!) then you’ll also love the leprechaun handprints we made. The handprints can be turned into St Patrick’s Day cards too! 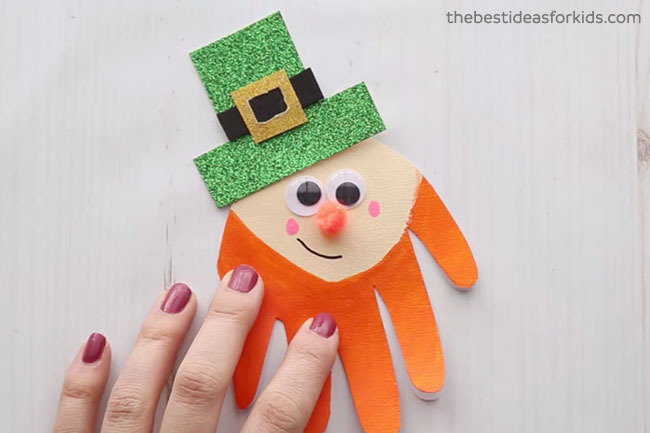 This leprechaun handprint opens up to be a card you can give for St Patrick’s Day!